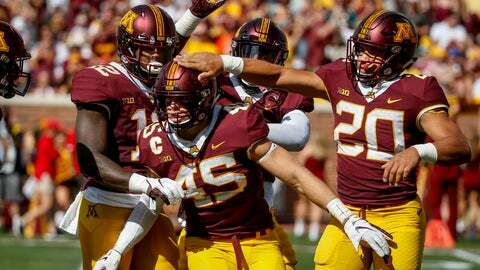 Carter Coughlin headed up six Minnesota players named All-Big Ten on defense and special teams. Coughlin, who led the Gophers with 9.5 sacks, which tied for most in the Big Ten, and 15 tackles for loss, was a consensus second-team selection. Linebacker Blake Cashman was named to the second team by the media and third team by the coaches. He led Minnesota with 104 tackles, tied for fifth in the Big Ten, and also had 15 TFL, had five passes broken up and forced a fumble, which he returned for a touchdown. In addition, safety Jacob Huff was tabbed honorable mention by both the coaches and media. On special teams, both kicker Emmit Carpenter and punter Jacob Herbers got honorable mention nods from the coaches and media, while returner Demetrius Douglas received the same honor by the media. The offensive awards will be announced Wednesday.